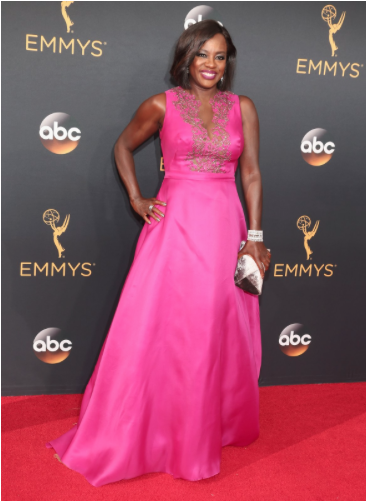 As tonight is the Emmy Awards, that means my red carpet fashion review is back! Ready? Here we go! 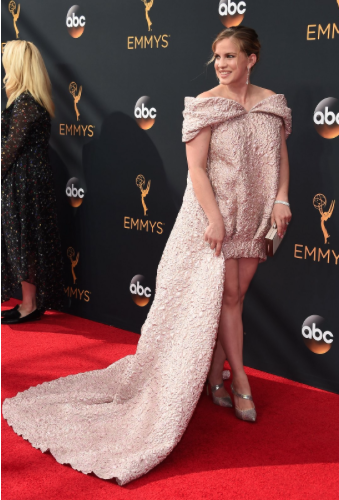 Okay, so when I went to the British Fashion Awards last fall, I saw Gwendoline Christie accept her style icon award and definitely noticed how tall she is (me, I have the opposite problem), but here–you almost don’t realize how tall she is, just how gorgeous and glam her dress is. So, bravo. The Netflix show is Stranger Things sweeping the nation, as is the child actors who star in it. And their wardrobe choices are fab. The boys look great in their interesting blazers. (That middle blazer, though?!?) Love. 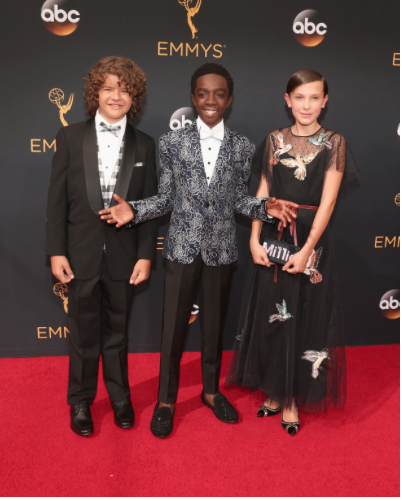 And young Millie wearing such a gorgeous Valentino red dress… Um, so is it to early to call Best Dressed yet?? Sophie Turner is wearing a stunning Valentino lace dress. Simplistic yet elegant. Stunning. And that picture— BLING. Sorry, I got a bit distracted by her ring. Very shiny. I love this Alexander Wang dress on Tatiana Maslany. It’s long and elegant (especially paired with her hair and earrings), but the cutouts add just the perfect amount of edginess that I love. Everyone has been praising this Monique Lhullier look on Sarah Hyland… Okay, brutal honesty time. I like the top: stunning. elegant. I like the idea of pants. I like the tailoring. I like her hair. Stunning. It’s just putting all that together looks a little disjointed to me and I’m not liking the combination of the stunning pieces. They just don’t really flow together– the colors seem mismatched. Love Ellie Kemper in Jenny Packham. Stunning. Glam. And I love her hairdo–so classic. Tori Kelly is classic Old Hollywood and looks great. STUNNING. Wow, I love Zuhair Murad, and Kristen Bell’s gown looks impeccable. Very princessy, very glam and very unique. Oh, I don’t even know what to think about Anna Chulmsky. That bad, that it’s rendered me speechless– in a bad way. Yikes. This does look like your grandparents’ sofa: the fabric, the color: blech. Kerry Washington in “baby bump chic” and looks just as chic as ever. Her dress is gorgeous. And even with minimal/natural makeup, she’s still flawless. Shiri Appleby of Unreal (love the show!) looks ahmazing and so glam in this sparkly blue gown. Stunning. Love it. Claire Danes look stunning in this very sparkly gold dress. But is it me or did she try to match her dress to her hair? Just a little bit? I think Sarah Paulson’s Prada dress HAS TO be my favorite gown on the red carpet. It’s just stunning. Utterly gorgeous. Okay, time to watch the show! What were your favorite red carpet looks of the night? And who are you rooting for? « What’s all the fuss about? Reviewing the Kylie Lip Kit.